Welcome to Leeds minibus hire. If you are looking for no-hassles group transportation arrangements in the LS postcode area, which covers Leeds city, and surrounding areas, such as Tadcaster, Wetherby, Pudsey, Ilkley, and Otley, you have come to the right place. 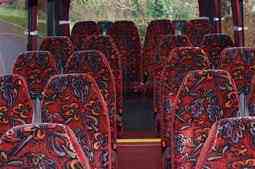 Customers who avail our Leeds minibus hire services once rarely go to others, and become our regular clients. They have left testimonials in our praise, in various forums. 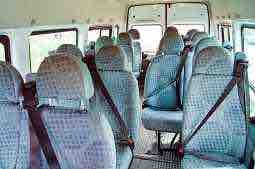 The following are some reasons, why we are the preferred chose for minibus hire in Leeds. We do not offer any vehicle, just to get a contract. When you make a booking with us, you are assured of a reliable, high end vehicle, which best fits your group size. We have, at our disposal, a large fleet of Ford Transit, Mercedes 16 seater, Volvos, and Ivecos, capable of accommodating eight to 72 passengers. These vehicles come with superior comfort and safety features, allowing your group to travel together, in unmatched luxuries. These vehicles also spot a sleek and trendy exterior, allowing your group to leave a powerful style statement. If you are a corporate customer, this is even more important, as our vehicles help you to leave a favourable brand image. Reliability and punctuality are the hallmarks of our service. We make it a point to honour our commitments on time. We never leave you in the lurch, as our previous customers would testify. We have a large fleet, to serve everybody on efficiency, and we have robust systems in place, to ensure all vehicles undergo periodic maintenance, and cleaning, and check on critical parameters, such as oil levels, tyre pressure, fuel, and more, before the start of any trip. We have a committed and dedicated workforce. Our drivers are experienced in navigating comparable vehicles, and double up as valuable resource persons. Our support staff, including customer support agents, work round the clock, and does all the background and coordination works, to ensure you have a smooth trip. Whether it is keeping track of traffic conditions in real time, to pass on critical inputs for drivers, to take the best routes, or following up with your group members on pick up points, our customer support team does everything necessary to make the trip a success, lessening the strain on you. We charge very low rates. Group transportation drives down cost, and our low margins, and low overheads resultant from smooth and seamless operations, mean that we can offer you very competitive rates, much lower than what our competitors charge. 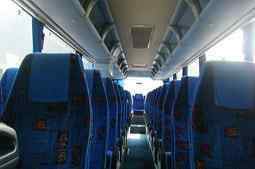 In many instances, you would be better off financially by opting for our Leeds minibus hire services, compared to taking your own transportation. We offer unmatched flexibility, to pick and choose from our offerings, to make changes, and incorporate special add-ons. Contact our customer support team for a custom quote, tailored to your specific requirements. We have smooth customer making systems, to make things easy for the customer. Booking a minibus is just a matter of filling up an easy online form, when you get an instant auto generated quote. You could also contact our customer support team, by multiple means, at any time of the day or night. We operate round the clock. Leeds, in West Yorkshire, 44 miles away from Manchester, has a population of 757,700 (2011 census), and is one of the well-known cities in England. The West Yorkshire countryside is noted for its scenic splendour, and offer several interesting days out opportunities. The Gold Acre Park offers sprawling landscaped gardens, set around a lake, and an arboretum. RHS Garden Harlow Carr, is another garden, and one of the most beautiful in the region. The Roundhay Park offers a rich collection of exotic plants and animals. The Meanwood Valley Trail is an interesting walk, extending seven miles in all, amid the lush nature, through the West Yorkshire countryside. The countryside of Leeds also abounds in several stately homes. Temple Newsem is a Tudor stately home, combined with a farm. Harewood House is a country house filled with art works, and spotting a bird garden. Lotherton hall is another estate, with nature trails, and bird gardens. The ruins of Kirkstall Abbey, a Cistercian monastery lies on the north bank of the River Aire, is one of the well-known historic monuments in the region. Leeds has several museums of interest. Leeds City museum, dating back to 1819, is one of the top attractions of Leeds, and offers a rich collection of artefacts, stretching over 540 million years of age. The Royal Armouries Museum offers a rich collection of arms and armour, and interesting insights on military history. The Abbey House Museum is interesting in that it interprets and showcases Victorian life, in a fun way. The Leeds Industrial Museum at Armley Mills showcases the industrial heritage of the region, brilliantly. Thwaite Mills is another industrial museum, with the chief attraction being a fully restored working water-powered mill that dates back to 1823. Thackray medical museum offers interesting insights on the history of medicine and healthcare. Among other attractions, the Leeds Art gallery is one of the major galleries in the whole of UK, and offers a rich and diverse collection of 20th-century British Art. The City Varieties Music Hall is an ornate, restored music hall, which runs regular live show, of music and comedy. The Grand Theatre and Opera house, is another famous landmark in the city. Lowest Rates Guaranteed save money on all sizes coaches. Business Accounts and Contract Work welcome. 24 hour service 7 days a week. Airport transfers Free parking included at all airports.